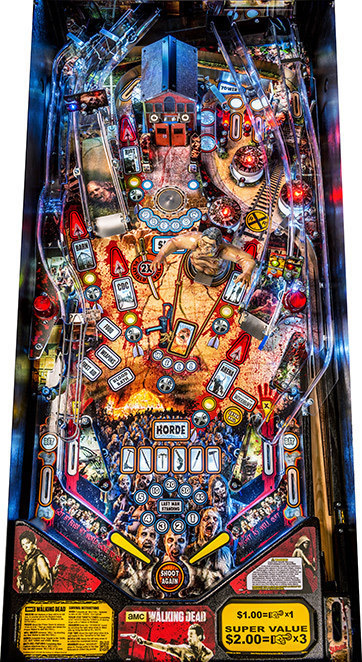 MELROSE PARK, Ill., Sept. 9, 2014 -- Stern Pinball, Inc., the world's oldest and largest producer of arcade-quality pinball games, announced today the availability of its Pro and Limited Edition models of AMC's The Walking Dead pinball machine. Inspired by the hugely popular AMC drama, the newest Stern game brings the hit series to life on the pinball playfield. MELROSE PARK, Ill., April 18, 2013 -- Stern Pinball, Inc., the world's leading maker of real pinball games and the AAMA 2012 Manufacturer of the Year, announces the availability of a second Premium model Metallica pinball machine. The initial release of Metallica pinball captured the attention of gamers and fans alike. Stern sold out of both the US and International allocations of its 500 Limited Edition ("LE") games within an hour of each respective customer announcement. The second Premium edition machine features the vibrant artwork of Dirty Donny Gillies and complement's Stern's Metallica LE, "Road Case" Premium and Pro models. MELROSE PARK, Ill., April 11, 2013 -- Stern Pinball, Inc., the world's leading maker of real pinball games and the AAMA 2012 Manufacturer of the Year, proudly announced today the availability of the Metallica pinball game. The newest addition to the iconic Stern collection of rock and roll machines honors one of the world's foremost rock bands. The Metallica pinball game channels the band's notoriously fast tempos and aggressive musicianship to set the tone for an exhilarating player experience. Players will be able to bang their heads and their flippers to 12 classic Metallica hits including "Master of Puppets," "One" and "Fade to Black." Other action-packed game features include an electric chair, snake, grave marker and unparalleled magnetic action. With the addition of the Metallica pinball game, Stern Pinball continues to hit the mark by attracting an array of pin players from Metallica devotees to gamers and consumer electronic connoisseurs.